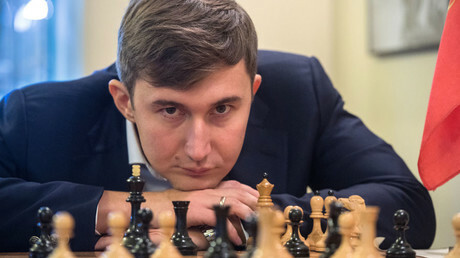 In an exclusive interview with RT, Russian chess grandmaster Sergey Karjakin discussed his performance in last weekend’s Wijk aan Zee tournament in Holland, his plans of going into real estate, and when he will return to the chess board. Sergey Karjakin once again obliged the Moscow public - visiting the capital’s famous bookstore 'Dom Knigi', fielding questions from fans, taking part in a simultaneous chess match with junior players and dishing out dozens of autographs. Karjakin was asked to talk about himself - a part of his life he rarely talks about and which hardly features online. He admitted that before crucial match moments he doesn’t get nervous, but if he starts to worry, he remedies himself with candy. During the meet, a young fan from Ukraine attempted to glean Karjakin's favorite song, and he responded by saying that his friends beg's him to perform Lady Gaga’s hit single ‘Poker Face’ during karaoke sessions. The doping issue then reared its ugly head. 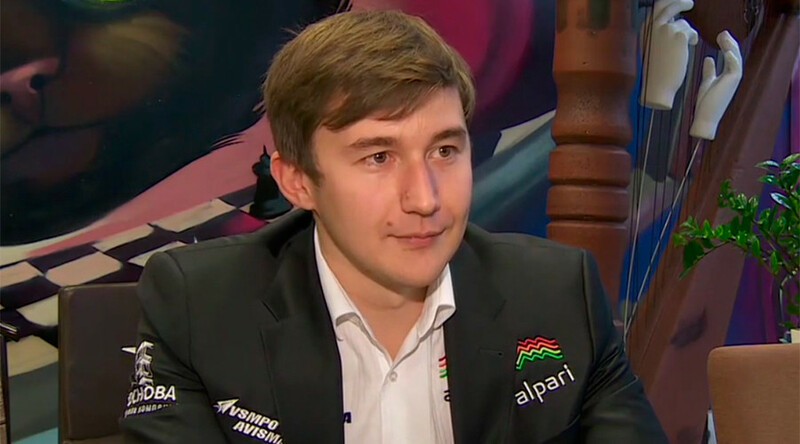 To the surprise of many, Karjakin revealed that chess players are also routinely checked for banned substances, but added that what concerns him most is the technology used to cheat during tournaments by those who aren’t sure of their own intelligence. 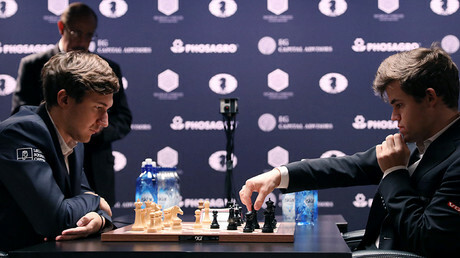 Karjakin then suggested a simultaneous chess match session, where he went up against seven potential future stars of the chess world. The grandmaster soundly dispatched his young opponents but failed to reach checkmate on two boards. The meeting ended with an autograph session, attended by Karjakin’s namesakes - the winner of the Dakar Rally and the modern pentathlon world champion, both named Sergey Karjakin. Karjakin then kindly agreed to share a few minutes with RT. RT: The last few months, you have had a timetable packed with meetings and interviews. Does it feel a bit like Groundhog Day? Sergey Karjakin: That’s exactly how it feels. Every new day in my life starts with a lift and then I go to a routine meeting where I have to give out autographs and pose for photographs. It stresses me out, but at the same time I love it. I feel the reaction of the people and see that I haven’t given my life to chess for nothing. People value my efforts. It so happens that popularity is challenging but at the same time pleasant. RT: The meeting at Moscow’s 'Dom Knigi' began with a Q&A with fans. Is it more difficult than a chess match? SK: The opposite, it gives me more of a mental challenge than when at the chess board. However, after the birth of my child I became sentimental, and when I host a simultaneous match session with kids, I wonder whether it’s worth beating them or better to play to a draw. I don’t have any thoughts to just give up, but I don’t want them to get upset. Evidently my paternal instincts have been awoken. RT: How did you feel playing against the seven young players? SK: It was great to play around. We had a couple of draws, and it was a credit to the guys. Those who managed such a result showed their best ability. RT: Do you remember the biggest simultaneous session you’ve taken part in? SK: It was in 2003 when I was about 13. I flew to London at the invitation of Lord Rothschild. There were 20 boards but when my opponents lost, a new person took their place. In all I played close to 72 opponents, and the session lasted for about 4 hours. Then I was incredibly tired, because I covered a lot of ground, but I lost and drew against very few of the opponents. RT: In November you challenged for the world chess crown against Magnus Carlsen, was this more difficult than playing simultaneously with several opponents? SK: A simultaneous game series - I can’t call it serious, but when I play against a few kids at once, I try hard to pass onto them my own attitude, to get them to relax. In the match for the world championship I needed to show all of my best attributes. There is no place for friendship, just for an intense rivalry on the chessboard. Of course, it is more difficult to withstand the marathon for the chess world championship title. RT: Do you remember a simultaneous game when you lost more than you won? SK: Yes, but it was not exactly fair. It was in Spain and my opponent used a computer to cheat, so I didn’t have much chance. It looks really strange when a person playing chess for almost the first time in his life, makes all the best moves. I was a little bit annoyed, not because I lost, but in my eyes, it’s not really right. RT: At which point do you realize that an opponent is using a computer to cheat? SK: A professional chess player straight away knows the ability of their opponent. When I play with kids, I can immediately determine who plays chess by making sound, rational moves, and those who just play around. RT: Did your self-esteem drop when that happened? SK: No of course not. Ultimately I competed against a computer and that is unbelievably hard. Rather, my esteem for that person diminished. RT: Your popularity in Russia has grown exponentially. But are you as well-known overseas? SK: In my home country, I’m a more well-known personality, but this was especially felt after my world championship match with Magnus Carlsen. In the Netherlands, a funny story happened. Someone approached me in one of the restaurants and asked for a photograph. After that, I noticed one other person who was staring at me intently. He came off the phone and at that moment I thought he would ask for a photo, but the young guy comes up and asks “Excuse me, but can I photograph your food?" (smiles) So I got my hopes up for nothing. RT: Fans probably ask you for photos and autographs. Do they sometimes start a conversation ? SK: Certainly, I am open for socializing. I can talk to fans on social media sometimes, but it’s not always that I can answer to everyone, because of the large amount of messages. Sometimes I don’t reply to some people, but that’s not because I conceited. Of course it’s easier for me to talk about chess, but I can keep up any sort of worthy conversation. RT: How often do people ask you tricky questions? SK: There are a lot of silly questions. During the world championship match, when I lost and the match was tied, the first question at the press conference they asked me “Are you frustrated?” Of course, I’m frustrated, why ask that? RT: Do you get any political questions? SK: I can openly speak about the situation with Crimea, given the fact that I come from Crimea, and have my full right to talk about it. I fully support the returning of Crimea to Russia. Other than that I would like to thank Vladimir Putin for bringing up the chess topic in his new year’s press-conference, and for his praise of my game against Carlsen. That was really pleasant to hear. 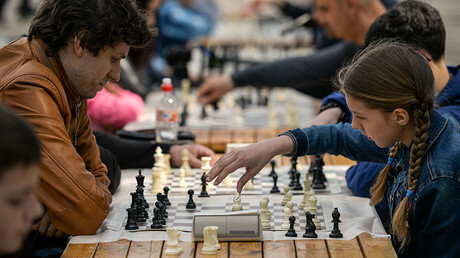 RT: During the tournament in Wijk aan Zee, Netherlands, you also made a video in which your son plays chess. Does he already play? SK: Lyosha [Karjakin's son] attends Capablanca Chess School [named after Cuban chess grandmaster Jose Raul Capablanca]. There they have all the things you need for a kid’s development into chess. RT: Would you want him to follow in your footsteps? SK: I think it would be great, but my wife and I joke that one chess player in the family is enough. If he likes it, then I will support him, and if not then I will not force him. RT: At the tournament in the Netherlands, you again faced Carlsen. Do you approach your meetings differently after New York? SK: Now we have become each other’s main rival. I feel that I’ve got what it takes to beat him. I knew this the whole time and believed in my ability, but now other people see this. My matches with Carlsen attracted colossal attention. In the Netherlands, it turned out a very intriguing match with lots of chances for both, but it ended in a draw. RT: Anatoly Karpov said not long ago that Carlsen is in crisis and has recently become more vulnerable. Do you agree? SK: You can talk as long as you want about the ‘crisis’ in his game, but the Norwegian is still the best player on the planet. When I manage to put pressure on him, then it makes sense to talk about a crisis. But I have to work hard for this. RT: Being named ‘world chess champion’ - is this your main goal? SK: Yes, I became champion of the world in rapid chess and blitz chess, and now there is only one unconquered summit. I won the World Cup and the winner of the tournament becomes the contender (to the title) but the main trophy for me I have yet to win. I will be focussing on that. RT: Many athletes actively get involved in business. In what sphere would you get involved in? SK: It’s too early to talk about that. The next 10-15 years I will dedicate to chess, and further along, we’ll see. Generally, I like the world of property. In a different life, I might have been a good real estate agent (laughs) but it’s not a thing I will get involved in right away. RT: Now you’re expecting a little bit of a rest, and you took the decision to miss a few tournaments. How long will your break last? SK: After the final in New York and the following events, I was pretty fatigued. I plan to have a break with my wife for a week by the sea, turn our phones off and not see anybody. Maybe to Dubai. From April, my timetable is full. RT: In which tournament will the fans see you again after your break? SK: It will be the championship of Russia among the club teams, where I will play for Team Moscow.